The Special Collections team manage archives and rare books and has its own reading room in the Research Commons, Old Library. We’re always keen to receive new deposits of archives and rare books, particularly relating to literature and west-country writers. We’ve been incredibly fortunate to receive the archive of John Jarmain, a writer and poet who lived in Somerset and Dorset and was based in North Africa and Normandy during the Second World War. Jarmain was killed in Normandy in 1944 but he had ensured the survival of his war poems by sending them home to his wife, Beryl, in a series of letters and airgraphs. The poems were published posthumously. 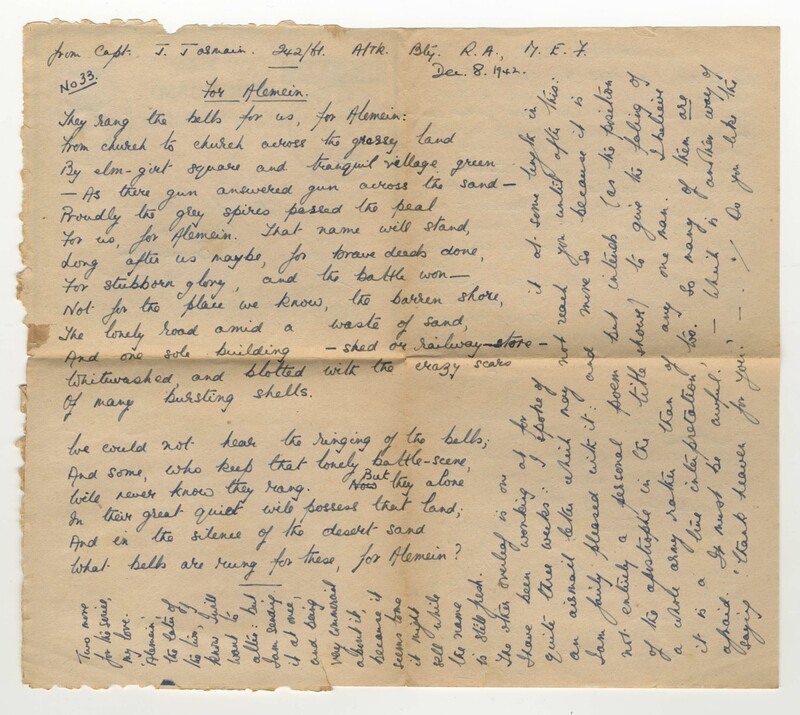 Jarmain’s letters contain drafts of some of his best known war poems, together with references to his children, particularly his daughter, Janet Susan, who was born in August 1942 two years before Jarmain’s death. However, Janet only discovered the cash of letters in which the original drafts were contained in 1990 after her mother’s death. It took her ten years before she could bear to read them. Last year, to coincide with the 60th anniversary of Jarmain’s death, they were re-published and the originals have now been donated by Janet to the University of Exeter. The archive is currently being catalogued and digitized and some of the letters are already available for research. We are hoping that the archive and Janet’s fascinating story will feature on BBC TV next week. Look out for more blogs and library/Heritage collections tweets. A Scan of the original “For Alamein” by John Jarmain in our new archive. This entry was posted in Special Collections on 31st Oct, 2013 by Susan Abbott. Looking for ideas for a night out? Have you visited the University’s Arts & Culture website to find out about a huge range of events taking place on Campus and elsewhere? Now the leading site for listing arts and culture events either at, or involving the University of Exeter, www.artsandcultureexeter.co.uk is the place to find out what’s on. This entry was posted in Special Collections on 14th Oct, 2013 by Susan Abbott. On Wednesday 6 November 2013, the Arts & Culture Team in conjunction with the Heritage Collections Department are proud to present one of Devon’s, and indeed the UK’s finest contemporary folk singers, Jim Causley. Accompanied by talented guitarist Lukas Drinkwater, Jim will be performing the wonderful songs he has composed to the words of the poems of his distant relative Charles Causley. As a special addition to this gig, which marks the 10th anniversary of Charles Causley’s death, copies of some of Charles Causley’s manuscripts of the poems Jim has set to music will be on display. 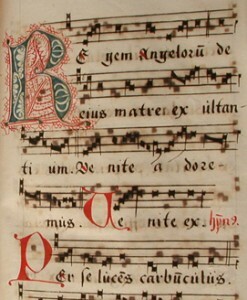 Originals of these manuscripts are held in the University’s Special Collections. The gig also provides an opportunity to experience one of the University’s newest music venues, Kay House Duryard, which is situated in Lower Argyll Road, off Cowley Bridge Road. A bar will be open on the night. Advance tickets are £10 (£8 for students). For more information about the gig and to book tickets, click here. We are lucky enough to care for some amazing collections here in Special Collections and one of our most widely used and most beautiful are the Syon Abbey collections. The community of Bridgettine nuns at Syon Abbey, South Brent, Devon is unusual in being able to trace an unbroken tradition reaching back to their Abbey’s foundation. The order founded at Syon Abbey in 1415 became a major focal point of religious activity in the sixteenth-century and was well-known for its publication of religious literature. A surviving set of rules for Syon Abbey emphasises the importance of books and instructs the sisters in their proper care. Both the nuns and the monks had their own libraries but no catalogue of the nuns’ medieval library has survived and little is known about what physically happened to either of the libraries following the Abbey’s dissolution in 1539. At the dissolution, the nuns went into exile and lived first in the Low Countries and later in Portugal. From the mid-sixteenth-century to 1809, when the nuns returned to England, the sisters lived as an English community at Lisbon. The collection of archives and books attracts considerable research interests from throughout the world. The collections contain liturgical and theological manuscripts, dating between the 15th and 17th centuries and the extensive book library contains pre-1850 titles from the library of Syon Abbey. Information on the archives can be seen on our online archives catalogue here and the books are catalogued on the library catalogue. 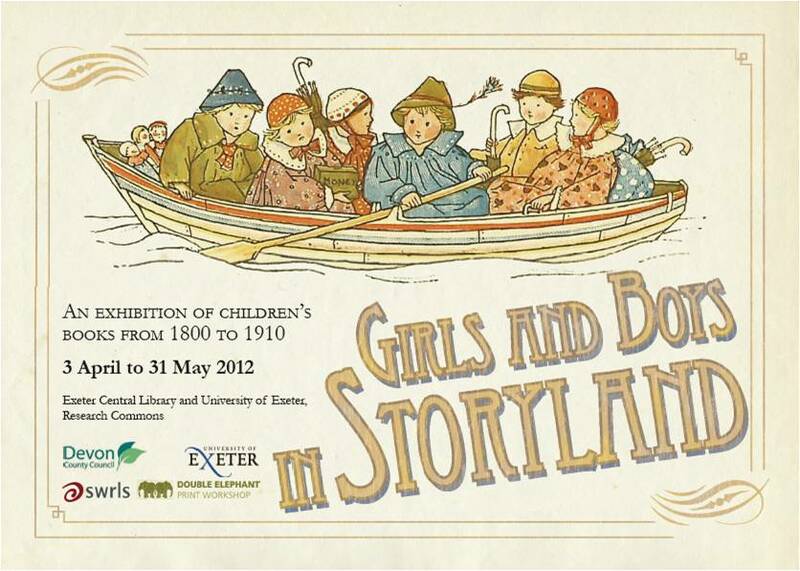 There is further information on our website at http://as.exeter.ac.uk/library/about/special/. This entry was posted in Research Commons, Special Collections on 13th Jun, 2013 by gpoulton. We have a wide range of collections covering most subject areas for teaching and research available in Special Collections. One of the most popular and well used is the Hypatia Collection. 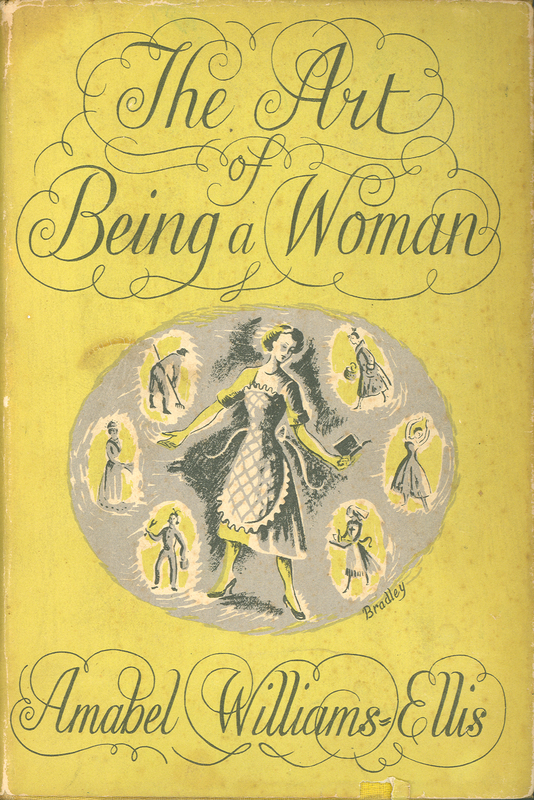 The collection contains books and journals exclusively by or about women. Its richness stems from the collecting habits of its creator, Dr Melissa Hardie, who acquired many ephemeral titles and books on subjects and by writers traditionally excluded from the academic canon in her aim ‘to make available published documentation about women in every aspect of their lives’. The collection is strongest on biography, social life, occupations and history, as well as on literature (especially fiction) and the arts. 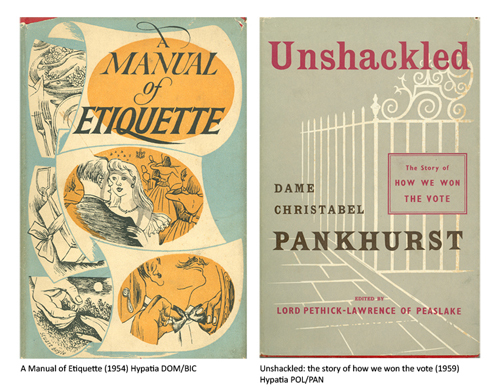 The collection is used extensively, both in seminars and independent study. The range of subject areas, from the academic to the ephemeral allows for wide areas of study to find material relevant to their research or assignments by both undergraduates and postgraduates. Browse the titles by selecting ‘local classmark‘ on the ‘Search’ options and by typing ‘Hypatia’ and the first 3 letters on each subject: ie‘Hypatia Bio’ for Biographies; ‘Hypatia Dom’ for ‘Domestic Science’… etc. The books are arranged alphabetically within subject sequences: The American Woman; Archaeology; Art; Biographies; The Cornish Woman; Crime; Diaries; Domestic Science; Education; Fiction; Health; History; Humour; Literature; Marriage and the Family; Myths and Legends; Natural World; Nursing; Occupations; Performing Arts; Poetry; Politics; Religion; Science; Topography; Travel; Women and War. This entry was posted in Research Commons, Special Collections on 25th Mar, 2013 by gpoulton. 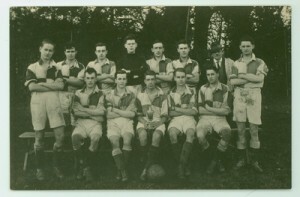 The University archive contains a diverse range of photographs, student publications and other material from throughout the history of the University of Exeter and its predecessor institutions from the late 19th century through to the present day, and covers the building programme for the Streatham campus, student and academic life, including Guild and Athletics Union activities. Coverage for some periods is patchy, perhaps in some cases due to the fact that the University Registry was bombed during the Second World War. 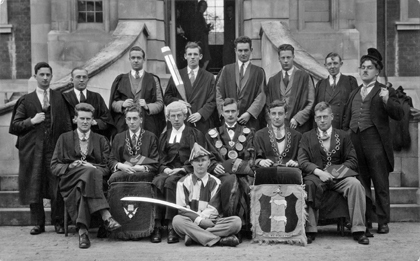 The archive is arranged and catalogued to reflect the progression of the University from the city centre site at Gandy Street to the development of the Streatham Campus, the individuals who have shaped its history throughout this period and the various events or activities which collectively have created the University’s particular identity. Sir Stafford Northcote began the quest for higher education in Exeter, with plans for a cultural quarter that would enable what he felt would establish ‘a very important system of education’. In 1861 land in Queen Street was donated for this purpose. The Exeter Technical and University Extension College began offering day classes in 1895. In 1900 the college became the Royal Albert Memorial College and began to offer degrees from the University of London. By the early 1920s the Streatham estate had been donated by the former Mayor of Exeter, W.H. Reed and the institution was granted University College status. The University College had applied for university status before; on the 21stDecember 1955, the University received its charter – the Principal became the Vice- Chancellor and the President the Chancellor. In 1955 there were around 1,000 students. Post-war expansion and a large building programme ran through the remainder of the 1950s and on into the 1960s until the present day. 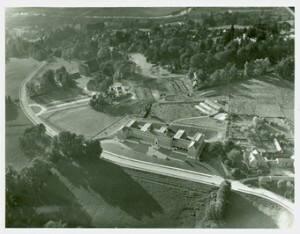 Arial view of campus, 1956 showing the construction of the chapel and the completed Hatherly building. The university archive is administered by Heritage Collections. Our webpages are at http://as.exeter.ac.uk/library/about/special/ . 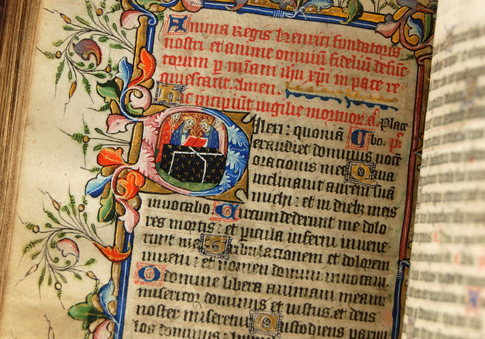 The Special Collections reading room is open from 10am – 5pm, Monday to Friday. This entry was posted in Research Commons, Special Collections on 27th Sep, 2012 by gpoulton. I’m in London today for the private view of the Exhibition Writing Britain: Wastelands to Wonderlands, opening at the British Library from tomorrow until 25th September. I came up to the British Library yesterday to install The Rebecca Manuscript in its case where it will stay for the next four months as part of this major exhibition. The notebook is part of the Waterlands section of the exhibition and the pages are open at the point in the book plan where a shipwreck is discovered……. An exciting day to be there, the gallery was a hive of activity with podcasts for the exhibition being recorded and other priceless manuscripts being installed around me. As well as the fantastic Rebecca Notebook I saw two manuscript pages of Dickens’ Our Mutual Friend and Exeter Cathedral’s priceless The Exeter Book going into their cases. I placed Rebecca in its secure case and as it was the last manuscript to go in everything was secured into place while I was there. It’s really good to see the care taken to ensure that the manuscripts are in the best possible environment for their four month stay. It’s going to be a wonderful exhibition and worth a visit. 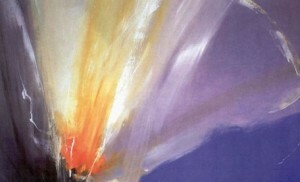 This entry was posted in Special Collections on 10th May, 2012 by Susan Abbott.